PRI’s Central Asia office has produced a roadmap for ex-offenders in Tajikistan, which contains information about support services that ex-prisoners can access. These services help with registration of documents, recalculation of pensions, receiving unemployment benefits, continuing education, and obtaining employment. 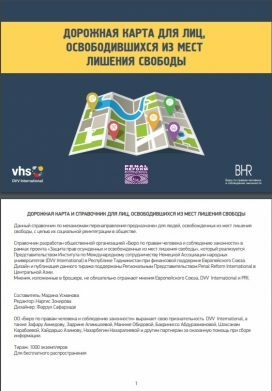 The handbook was prepared within the framework of a project implemented by the Institute for International Cooperation of the Deutscher Volkshochschul-Verband e.V. (DVV) in Tajikistan, in partnership with local NGOs Bureau of Human Rights and Rule of Law, and Jahon. The design and publication were managed by PRI’s office in Central Asia. The aim of the publication is to provide a useful tool for creating effective resocialisation programmes for ex-offenders. The roadmap is published in both Tajik and Russian.